On February 13, 2016, leaders and committee members from every branch offering Sea Kayaking met in Tacoma. Their discussions led to a recommendation now been adopted by The Mountaineers. The Branch Leadership Committee (formerly named the "Managing" Committee), consisting of Branch Chairs, Board Members, and staff, recently approved the recommendations for changes to the Minimum Standards for Sea Kayaking. 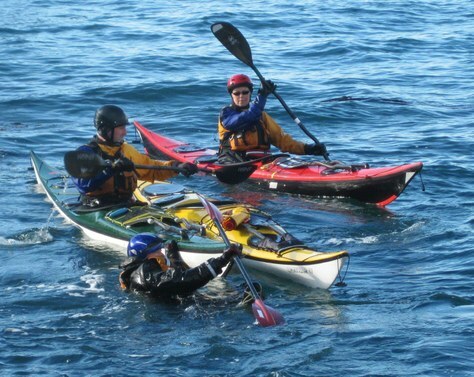 These changes now apply to all Sea Kayaking activities at every branch. As part of a yearly review process, leaders and committee members from every branch that offering Sea Kayaking met in Tacoma and discussed their shared concerns, some of which involved making updates to the Minimum Standards. That body of paddling experts agreed on changes to the minimum standards,development of an intermediate kayaking course, and other issues common to all. Many of the branches also deliberated over the new proposal at the Branch Council level. These policy recommendations were then recommended to the Branch Leadership Committee, who adopted them for the organization (our Board of Directors delegates activity standard questions to the Managing Committee to determine). Clarification that the Coast Guard requirement for carrying visual distress signals (such as flares) must be complied with by leaders (directing leaders to ensure compliance). Reducing the swim test requirement to 25 yards (one length of a standard-size pool), from 50 yards which did not contribute to improved safety precautions enough to justify cutting into instructional time for other skills. Confirmed curricula for an Intermediate Sea Kayaking Course across all branches. Questions to prompt effective and efficient examination of potential equivalency candidates solidified. A requirement that ALL instruction be offered "off-water" was removed to facilitate more experiential learning and innovation in course offerings. A graduation requirement for the Basic course was modified to insist that "wet exits" from a kayak be completed "effectively" and "without instructor assistance", rather than increasing the number of practices all students have to perform before graduating. This emphasized mastery of the task more than repetition of this essential life-or-death skill. This progress shows how the "summit process" is can be so effective in bringing together Mountaineer experts and ensuring our practices are up to date. The NEXT Sea Kayaking Summit is already scheduled for Saturday February 11, 2017 at the Tacoma Program Center.